Your outdoor space should be an area for your enjoyment and entertainment year-round. We specialize in transforming your backyard into a work of art. Whether you are interested in a patio or deck; outdoor kitchen, bar or barbecue; outdoor fire place; fire pit; arbor or pergola; or pool, pond or water feature; Kalyx Green provides superior craftsmanship and service. We will work to exceed your expectations through design and installation of the best products with the longest industry warranty. After all, your outdoor living should give you the same pleasure as your indoor living. Kalyx Green has installed many types of water features, including over 60 koi ponds. 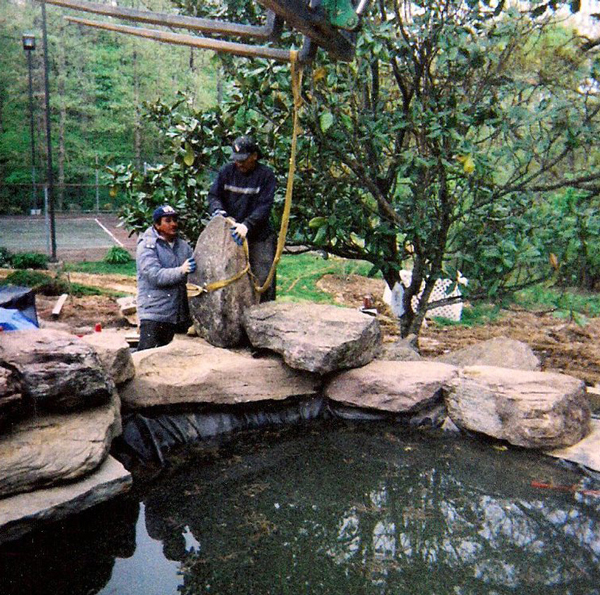 We are one of the premier pond-less waterfall specialists in Maryland, Northern Virginia and the DC Metro area. Through careful selection of boulders, rocks and plant material, our aim and philosophy is to see that the final water feature looks as if nature had a hand in its creation. Whatever your dream for your outdoor space, let Kalyx Green help make your vision a reality. Call today, or view more of our past work in our gallery.